My Volunteer Butternut Squash Is not Producing! Why?? I received this question from Julie of Charlotte, North Carolina and Diane from Georgia. There are many factors that may have caused this issue. 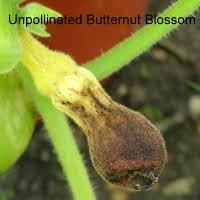 Lack of pollination or lack of pollinators. 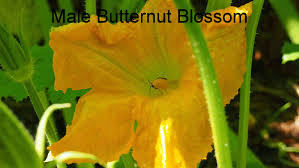 The above picture provides a solution when there is a lack of pollinators. 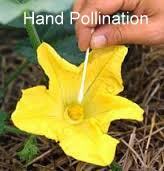 Hand pollination is a viable alternative to achieve proper fruiting. Using a Q-tip or a soft paintbrush, you may take pollen from the male flower and apply the pollen to the female flower. 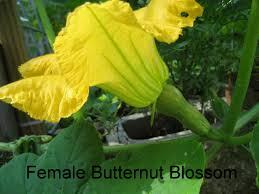 Early to mid morning is the best time to pollinate. Too little irrigation or drought causing stress and subsequent fruit drop. 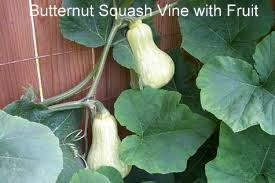 A good strategy would be to plant your squash early (right after last frost) and again about a month later. One of the two (2) crops may produce because you may avoid excessive rain, drought, disease pressure, cold/heat or insect pressure. Seaweed emulsion or kelp meal will pick up any nutrient deficiency and aid the plants with stress issues. It is worth the effort to produce delicious squash!! < Previous Succession Planting for Success!! Next > The Joy of Garlic! !